The Taung Child is a fossil of a skull. The skull also has an imprint of the brain. It belongs to an Australopithecus africanus. It was discovered in 1924 by a quarryman working for the Northern Lime Company in Taung, South Africa. Raymond Dart, an anatomist at the University of Witwatersrand, looked at the fossil, and saw its importance. Dart published his account in the journal Nature in 1925, describing it as a new species. British anthropologists at the time believed in the Piltdown Man. This hoax had a large brain and ape-like teeth – the exact opposite of the Taung Child – so Dart's finding was not appreciated for decades. The fossil consists of most of the skull, face and mandible with teeth. It also has a natural endocast (imprint) of the braincase. It is about 2.5 million years old. 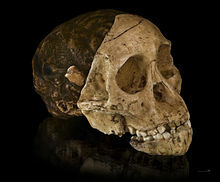 Taung Child is believed to have been about three years old at the time of its death. It was a creature standing 3' 6" (105 cm) at approximately 20-24 pounds. Taung Child had a cranial capacity of 340 cc, living mainly in a savanna habitat. Examinations of Taung Child compared to that of an equivalent 9-year-old child suggest that A. africanus had a growth rate to adolescence which is about the same as that found in modern apes like chimpanzees rather than that of modern Homo sapiens. However, later species such as Homo ergaster/Homo erectus went through growth at rates between modern humans and apes. The evidence has mostly been based on that of Turkana boy discovered in 1984. In early 2006 it was announced that the Taung Child was likely killed by an eagle (or similar large predatory bird). This conclusion was reached by noting similarities in the damage to the skull and eye sockets of the Taung Child to the skulls of primates known to have been killed by modern eagles. The left hand side of the endocast of the Taung child is covered in beautiful calcium carbonate crystals. Its significance lies in the fact that this was the first of the fossils which had been found in the twenties and thirties to provide evidence that humans indeed have a 'natural history' all of their own – just as Darwin had predicted. The skull is now in repository at the University of Witwatersrand. ↑ Brain C.K. Raymond Dart and our African origins, in A century of Nature: twenty-one discoveries that changed science and the world. Laura Garwin and Tim Lincoln, eds. This page was last changed on 10 August 2017, at 23:00.